of course i won't tell them that besides the baby, i have also been hiding way up in my tower of transformation messing with alchemy ;) shhhh ... not a word! yes! i have been experimenting with turning metal into ... well, not gold, but something close to gold. you see, i had some 14 gauge silver plated wires and i do miss my elf frens, so i formed them into swirls that will remind me of Lothlorien. HAH!!! at least it's organic and eco friendly! well ... that's silver and egg ... now for something hotter! brass and fire! i bought some raw brass wings from etsy and of course, how can i resist not turning them into something else?? this one was on the stove for a little longer and you get a nice brown vintagey look ... of course it takes some sanding and polishing to bring out its beauty. i left the other side, untouched, as comparison. Clean that stove at once young lady! Ha - only joking... you should see my house!! I have spoken to the Elves and they quite understand. They do visit you every now and again but they said they always seem to turn up when you're asleep, so they just sprinkle some magic about then pop off again. 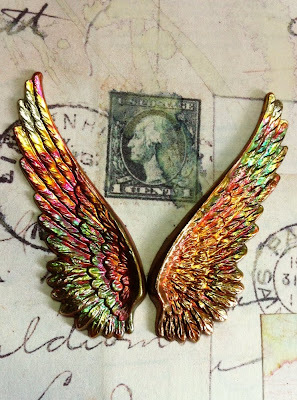 I love the pieces (of course, I loved Tolkeins books) and what you did with the wings is amazing! I use my stove to torch the paint off anchovy tins..... your stove is CLEAN! BTW---would you share the source for the wings? I've been looking all over for them and have yet to find any. I have torched copper but not brass. Will have to give it a try as your results are just gorgeous. Wow! 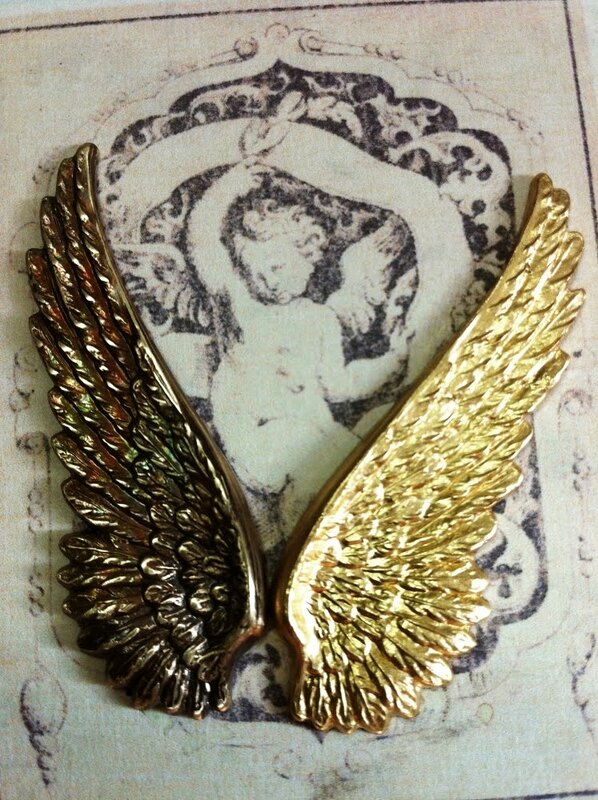 The brass wings look so cool! I like the irridescence...oh and thank you for the video. I really like the necklace you made too by the way..great quote! I love your elven swirls and the earrings - they're just gorgeous. Thanks for the video, so very generous of you to show exactly what to do. 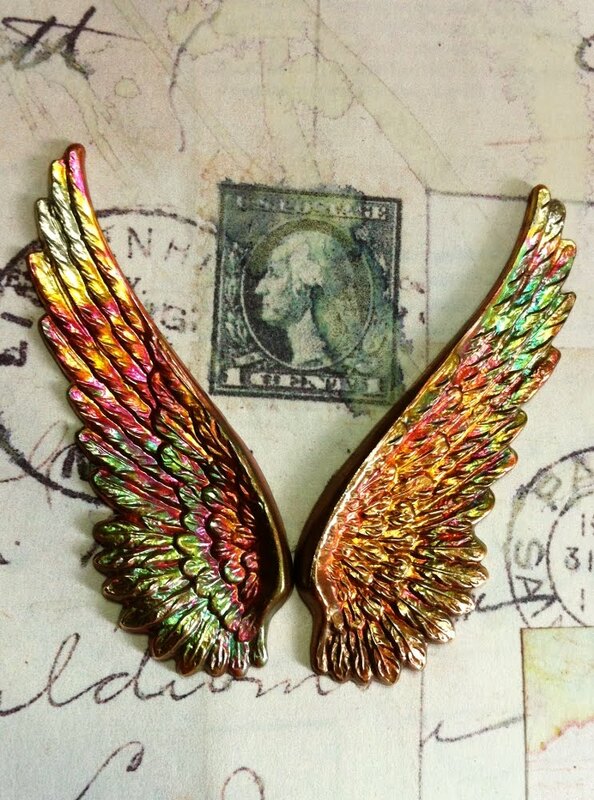 The wings are stunning, the irridescence very worthy of elven folk. I love your humor and your great video. I've been wanting to see how other artists get the heat patina so vivid. I use my brulee torch and it always seems to go dark too fast. I have trouble keeping it in the colorful zone. I think I need to turn my flame down. And I totally love Unicorns! I have successfully flame patinaed copper, but brass evades me. I find my brass discs just becoming a dark brown - no colors - what do I do?